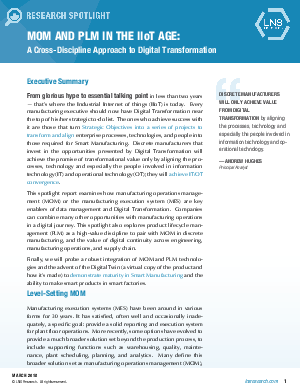 • How Manufacturing Operations Management (MOM) or Manufacturing Execution Systems (MES) are key enablers of data management and Digital Transformation. Companies can combine many other opportunities with manufacturing operations in a digital journey. • Product lifecycle management (PLM) as a high-value discipline to pair with MOM in discrete manufacturing, and the value of digital continuity across engineering, manufacturing operations, and supply chain. • A robust integration of MOM and PLM technologies and the advent of the Digital Twin (a virtual copy of the product and how it's made) to demonstrate maturity in Smart Manufacturing and the ability to make smart products in smart factories. The IIoT has opened up a world of opportunity for manufacturers. Take advantage of it. From glorious hype to essential talking point in less than two years — that’s where the Industrial Internet of things (IIoT) is today. Every manufacturing executive should now have Digital Transformation near the top of his/her strategic to-do list.